A biker soundtrack to end all biker soundtracks – one that shares plenty of elements with better-known entries in the genre, but which also has some really wild and offbeat moments! As with most of the short-lived motorcycle soundtrack era, the vibe here is much more rock than other film scores of the time – written and performed by Don Gere, with a variety of styles that echo some of the fake groups that were often thrown together for bigger biker films – but sometimes with looser, weirder elements that really deliver the kind of sounds that we always expected on other biker soundtracks, but which were instead buried under piles of b and c-grade psych. Instead, Don really serves up the goods here – especially on some of the more fuzzy Satanic ritual tracks, which also have some great sound effects – and which then have you embracing some of the straighter rock tracks, almost as a relief. 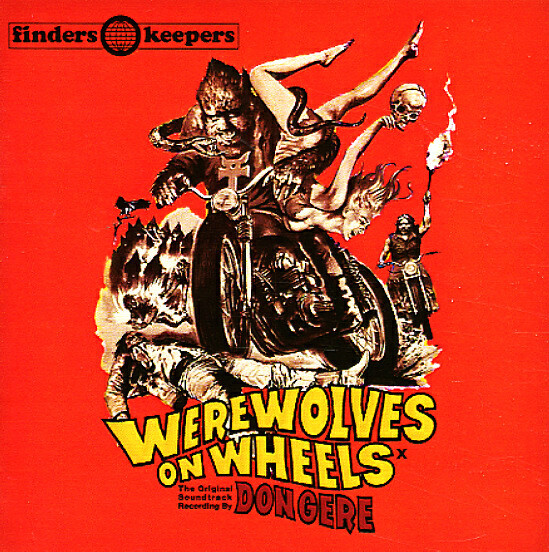 Titles include "Werewolves On Wheels (Main Theme)", "Mount Shasta Home", "Ritual", "Ritual 2", "The Devil's Advocates", "One Foot In Heaven", "Burning Grass", "Tarot", "Tarot Trail", "Dust Bowl", "Ritual 3", and "Werewolves On Wheels (End Theme)". © 1996-2019, Dusty Groove, Inc.